From the moment you step inside this unique ranch style home, you know you have come upon a hidden gem! This 3 bedroom 2 bath retreat has a superior craftsman touch. Tile and wood floors lead you throughout with hand crafted built ins, a gorgeous kitchen is highlighted with an antique stove. There are wood burning fireplaces, vaulted beam ceilings, and an expansive custom master bedroom closet. As you move through french doors to the backyard a stunning journey begins with a built-in BBQ, pool, spa, gazebo, kids playground, custom built shed and many sitting area's that include a view deck on top of the house. There is a separate pool house with kitchen, full bath and loft! 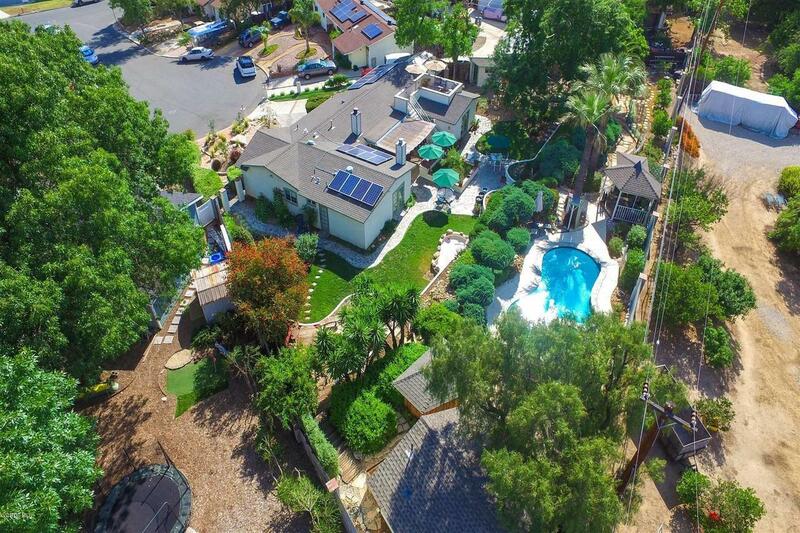 A vegetable garden awaits your green thumb, and for fun, there is even a zip line over the pool!And if you enjoy going green, the front yard is drought tolerant, there is grey water conservation through the indoor washing machine, and the entire home's electricity is powered by solar. This home even has a tandem 3 car garage. A rare and wonderful opportunity!